Decorating with white ruffled comforters and bedding sets like these are the ideal start to a sophisticated, delicate ambiance in your bedroom. Bedding with white ruffles can create a number of genres, from sweet and simple to subtle and sophisticated, making it the serene retreat you'll appreciate after a hectic, nine-to-five workday or a busy day with kids in tow. Using white ruffles as your bedding's palette means balancing your space in texture, color and style. And therein lies the tricky part. If you're not among the decorating ilk, don't worry; I'll show you how to transform your BLAH! space into "VIOLA!" 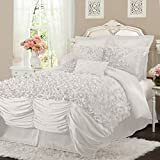 Scroll down and peruse some fabulous white ruffled bedding set options you're gonna love along with my tips and 'tricks' for making easy~peasy work of decorating your boudoir. White bedding sets with ruffles like these betray pure opulence, a sense of luxury all its own. You may want to bathe your bedroom walls in white or other, non-competing soft hues to keep a crisp, clean look that's bright and airy. Conversely, for drama and/or warmth, you might opt to pair your new white comforter with darker walls (like the model bedroom here) where you can appreciate the contrast between your bedding set and its surrounds. The choice is all yours; make your space your own! Technically speaking, white isn't a color on the prism but it is one amazing element to decorate with, especially when texture (think ruffles) is at play. Whenever we use white in layers, light hits every angle of an object and produces a completely different look than you perceived earlier. You can take a photo or pop into a room with white textures at a given time of day and you've a 'new' vision to behold. Introduce ruffles and/or lace to your room's scheme and this play on light increases tenfold. While we often consider white as a blank slate among its rich hue contenders like yellow, red and vibrant blues, it's that 'blank slate ideal' that affords the most promise in freedom of expression, as nothing is off limits in the way of accentuating color. So, have at it with white and make your bedroom space truly your own. I'm a firm believer in the mantra, 'less is more' with certain decor. With white ruffles, this ideal couldn't be truer. When working with all white bedding sets, dressing the room's windows is much easier: simply choose solid panels like those I've included, here. With their layer upon layer of ruffles, these window panels will serve the space well and won't compete with your bedding. And you'll have just the right amount of layering to add warmth and texture to your bedroom. I wouldn't hang colorful or patterned window treatments, as doing so will distract the eye and completely overshadow your space's main attraction: the bedding set. Keep windows simple and solid white for best results. Decide whether sheer or opaque curtains will serve you better. If you're a late sleeper, I recommend opaque panels; otherwise, sheers are a delicate addition that will lend to the cohesive look you're after. This elegant ruffled panel uses cascading layers of soft, crinkled voile to create an elaborate bouffant styled panel. Veering to the left with your intended color is okay when you find your eyes feasting on a particular decorative piece much like this ensemble. While perusing the available bedding sets with ruffles, I happened upon this amazing 'gotta-have'; it's certainly worth taking a second look - even if it is ivory (aka ivory). Little changes are best made in the earliest phases of decorating, as it may mean changing wall color. If you're thinking 'warm and cozy' an off white bedding set will serve you better. Changes are fine but the earlier they're made, the better. Ruffles and lace go hand-in-hand to make spaces all the more luxurious, as they compliment and support your focal point when appointed appropriately. All that sounds a bit wordy, doesn't it? Simply put, you want to layer your pieces to create a cohesive, finished look. Begin with your bedding and add pieces like these pillows, plush area or accent rugs and maybe a throw done up in ruffles. Add soft, not harsh or direct, ambient lighting. 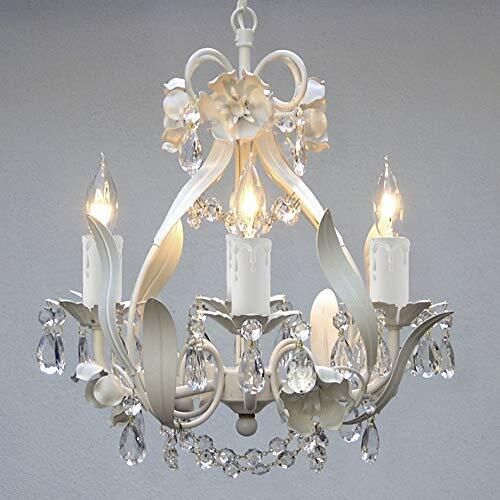 Crystal and white chandeliers are an amazing option for pairing with ruffles. After your initial, most important pieces (like the bedding a rug and/or chandelier) are arranged in your space, every addition should support those first few elements. Be sure these new pieces lend to the overall arrangement of your palette and not compete with it. This pillow cover is made using White Satin Fabric with Satin Ruffles. With a lovely white ruffle exterior, this pillow will bring a sense of fashion and beauty to your room. Ivory & White: Can it Work Together? I'm loving this ivory ruffle bedding! True, it's not the solid white we've been talking about but this set does have all the elements of luxury with its plush-and-plentiful ruffles. I can appreciate the added warmth the richer color will lend to a space -- especially in the bedroom. One thing I did notice, and wanted to include, is an example of ivory (and other 'off-whites') working cohesively with pure white. The model room, here illustrates how well the two hues can be paired with bedding and window panels. Too the table lamp being solid white isn't a distraction at all; it just makes the bedding set look a bit more vanilla. Isn't this ruffle bedding set luxurious? As someone with little patience for crafting, this easy-as-pie project will get you the 'custom' wall art you want for your taste and ruffle-inspired decor. With this project I want to add a few tips and tricks for saving money and adding opulence to this simple project--while keeping it simple. In the video you'll see the host simply covering a blank canvas with ornate tissue paper. But consider these tips for making your own art even more you. Save money on fancy tissue paper. Buy clearance Christmas tissue paper; often you can realize a 75% savings simply because the paper was seasonal. Use big box craft store coupons and buy a large stamp like fleur di lis and dip the stamp in craft acrylic paint. Gently press the stamp on a scrap piece of paper to get most of the paint off the stamp. Press the stamp with the remaining paint firmly on your newly wrapped canvas. You'll achieve a vintage look that'll look fabulous with your ruffled bedding. You can buy the acrylic paint in a host of colors for super-cheap (under $1). Instead of the stamp, opt for a wood trim piece. I bought a fleur di lis wooden trim piece for less than $5. You'll have a fabulous relief piece of art that's quite impressive! Where do you plan to use your white ruffle bedding? I'm loving the white ruffles, so my master bedroom it is! Lattice (or trellis) bedding like these comforters sets make an ideal contributor to a bedroom's decor, as the fresh design seemingly breathes life into tired spaces.